JVC is a brand long been known for having products much ahead of the market curve. In 2004, they wowed the industry with the 1st ever consumer HD camcorder. And in 2011, they were one of the very few that presented their own revolutionary 3D camcorder on the show floor. This time yet again, JVC has wowed their audience with the release of the ever anticipated GY-HMQ10U 4K Compact Handheld Camcorder. JVC’s GY-HMQ10U records real-time videos at 4x, the full HD resolution – that’s 3840×2160 at 24p, 50p or 60p. But it’s really the camcorder’s optical system that is of top-notch caliber. This product employs the razor sharp F2.8 10x optical zoom lens designed specifically for 4K recording. opted for the use of half an inch sized sensors with as many pixels but HMQ10U remains one of the very few that can take 4K videos. In this Review, compression stands a big issue. 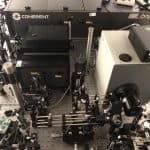 The tremendous amount of data from capturing videos 4 times more the normal full HD resolution is processed using arrays of custom Falconbrid LSI chips. These chips deBayer images and then provide live 4K outputs while compressing the video simultaneously to get it recorded onto a separate memory card. Individual streams can record at a maximum bitrate of 36Mbps, totaling to 144Mbps when put all together. 4K footag is converted to the MPEG-4 format with the use of multiple processors. Footage is not primarily AVCHD compliant because no AVCHD standards exist for 4K video recording. However, the JVC GY-HMQ10U can be used as a 1920×1080 Full HD recorder at 50/60i or 50/60p and at such time, recordings can be converted to the AVCHD format. 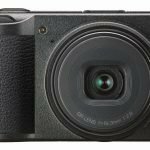 The GY-HMQ10U comes with 4 memory card slots and we just have to emphasize in this JVC camera review that all four need to be used at the same time for the capturing of 4K video images. However, when shooting regular HD videos, loading just 1 card will be enough. This camcorder has been designed for professional videographers and serious video enthusiasts so controls really aren’t its thing. However, it still has the Full Auto button which puts the camera under a completely automated control. 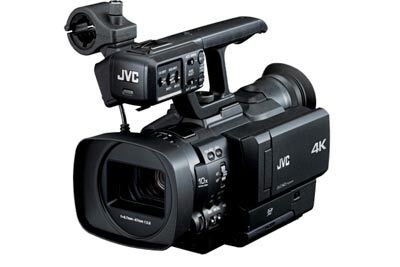 The auto mode comes off very similar to other JVC consumer camcorders but with added improvements as with the AE shift. JVC provides a specific file utility that combines all four individual video streams into one editable file. Users will still need to have the 4K-compatible video editing program nonetheless. 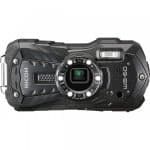 Comparing the GY-HMQ10U to other camcorders on our JVC camera reviews, it really isn’t the most difficult prosumer level camcorder on the market. Its controls are well-displayed and organized, making it much easier to navigate through the options. 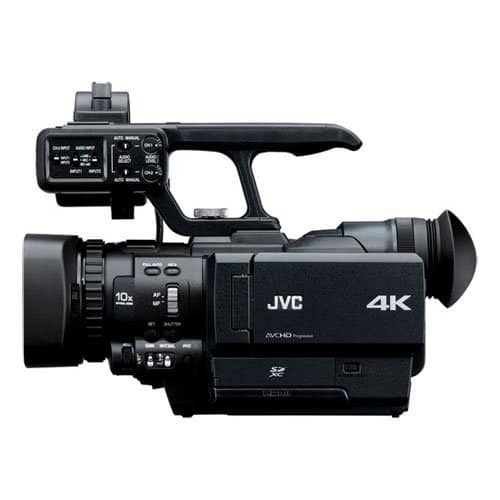 Anyone with experience handling camcorders will definitely not have much of a hard time with this JVC model. Compared to other 4K camcorders on the market, the GY-HMQ10U is certainly the more portable option. 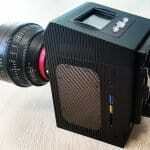 It’s more compact and also much smaller than most other professional camcorders on our JVC camera reviews. However, considering the need for 4 SD memory cards to shoot, it’s quite easy to figure out where this JVC video recorder is short in the aspect of portability. The JVC HMQ10U 4K is the first model of its kind to be marketed by a major manufacturer. As such, it really won’t be long until competition will start boiling up. With the aggressive price of $4,995+, in conclusion to this JVC camera review, this model is certainly worth considering and is one that will make for a smart investment.